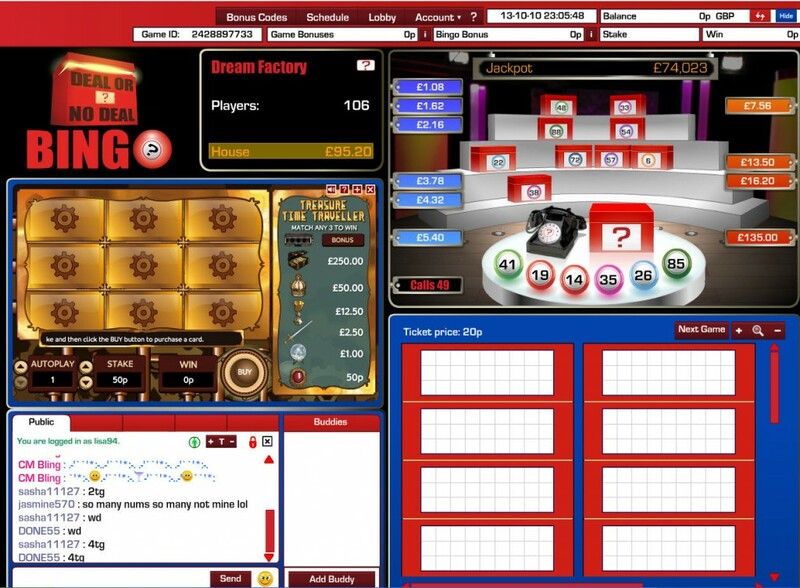 Deal or No Deal Bingo - Play Deal or No Deal Online for Real Money! One of the UK’s most popular TV shows now how has its own bingo game as Playtech have teamed up with the production company, Endamol to bring Deal or No Deal Bingo to the internet. If you’re a fan of the game show, then you’ll be pleased to hear that it translates very well to the online medium. In fact, the game is very well designed in general. In many ways, Deal or No Deal is very similar to a standard game of bingo: balls randomly get drawn from a hat, and if the number on the ball matches one of the numbers on your card, you can cross it off. Prizes are then awarded to the first players who are able to complete one line; two lines and then the entire card. However, where Deal or No Deal differs is that every time a ball is drawn, a box with a corresponding number on the front of it is also opened to reveal an amount of money. Just as in the game show, you ideally want these sums of money to be low amounts so that the most valuable boxes remain in play. You’re able to keep track of exactly which boxes are remaining thanks to a number of red and blue icons which appear down both sides of the screen – it’s just like you’ve seen on the TV. As you would expect, those players who are able to complete the necessary patterns are given chase prizes … however there’s a twist in store for the first person to complete an entire card. When this happens, the lucky player must decide whether she wants to take the amount of money that she has been offered or gamble it all for what’s in the box in front of her. Just as on television, the banker will make the player an offer for her box which she must decide whether she will accept. The player is given 30 seconds to make her decision while the other players in the game are able to vote on what they would do if they were in a similar situation. Once the player has decided whether she is going to deal or not, the box on the table is opened up to reveal an amount of cash inside. If the player has chosen to Deal, she will be given whatever is in the box (as little as 0.01p or as much as £1,000). However, if the player has decided No Deal, she will walk away with whatever money was initially offered to the player at the beginning of the game. Deal or No Deal Bingo is a game which is available at only a few Playtech bingo rooms. We would recommend to all our readers wanting to give the game a try that they do so at www.Bet365.com. Not only is Bet365 one of the largest and most trusted games operators out there, but they are also incredibly generous when it comes to promotions and bonuses. All new players making their first deposit will be able to take advantage of a welcome bonus worth up to £150 and then benefit from weekly bonuses after that. For more information or to play Deal or No Deal Bingo now, head on over to www.bet365.com.